She became the first Indian woman to reach the fourth round of a Grand Slam tournament at the 2005 US Open, defeating Mashona Washington, Maria Elena Camerin and Marion Bartoli. In 2004, she finished runner up at the Asian Tennis Championship. In 2005 Mirza reached the third round of the Australian Open, losing to eventual champion Serena Williams. 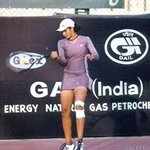 On February 12, 2005, she became the first Indian woman to win a WTA singles title, defeating Alyona Bondarenko of Ukraine in the Hyderabad Open Finals. Sania won the Wimbledon Championships Girls' Doubles title in 2003, teaming up with Alisa Kleybanova of Russia. As of September 2006, Sania has notched up three top 10 wins against Svetlana Kuznetsova, Nadia Petrova and Martina Hingis.At the 2006 Doha Asian Games, Sania won the silver in the women's singles category and the gold in the mixed doubles partnering Leander Paes. She was also part of the Indian women's team that won the silver in the team event. She has stated that one of her best friends is fellow WTA tour player, Anna Chakvetadze.